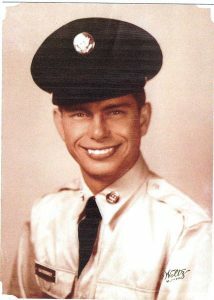 Roger Sauerbrey of New Germany served as a teletype operator in the Army Signal Corps during the Cuban stand down. He is one of several members of the Sauerbrey family featured in the Carver County Veterans Memorial online registry. From the Civil War to the conflict in Iraq, veterans’ stories are being told through the Carver County Veterans Memorial and Registry. The memorial will be built at the head of the Dakota Rail Regional Trail in Mayer. Each veteran will have a 70-pound, 16-inch-long paver stone, engraved with their name, branch of service, and era in which they served. Some people have been purchasing pavers and submitting stories for military family members who have passed away. One example is the story of Henry Wolf, who died while serving in the Civil War. Wolf, 35, had been a farmer before becoming a private under the command of Captain Vander Horcht in the Minnesota infantry in March 1862. He died just over a year later, July 29, 1863. To find a veteran’s story, go to www.ccvmr.org, and type in the last name of the person you’d like to find in the “search” box. Veterans don’t need to have served in a war to be included in the memorial. A monument company in Cold Spring has been selected to construct the lighted memorial, which will feature six granite stones, three on each side. There will also be an American flag, and one flag for each branch of the military. Other planned features include meditation benches, a glass display case, and attractive landscaping. The center will include a spot to honor soldiers who were killed in action. Fundraising efforts are underway, and several organizations and individuals have already generously donated in support of the memorial. To learn more about the Carver County Veterans Memorial and Registry, to donate, or to reserve a paver, call (612) 888-6366, or call Stan Heldt at (952) 657-2169. Copyright © 2019 New Germany, MN. All rights reserved.